Monday evening I ran out of work to get Wyatt and make it to the tack shop in town before it closed at 6 pm. Tack shopping with a 3 year old is no laughing matter. It was a good thing that the shop had a resident friendly dog to keep Wyatt company as I tried on helmets or else who knows what I would have been forced to purchase. Well....actually....maybe he should have put his stinky fingers on a nice riding shirt or dressage saddle or summer riding boots...I need to teach that kid a thing or two about keeping his hands to himself. Sorry honey, but Wyatt put a small scratch in it so I was forced to buy this wonderful piece of tack. Nothing I could do! 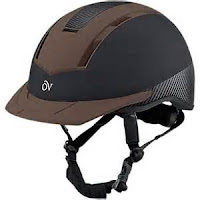 After doing some research online, I had narrowed it down to the Ovation Extreme and the Tipperary Sportage as helmets in my price range. Thankfully, this shop had both so that I could try them on and see which fit my head right. 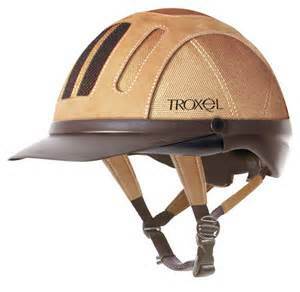 My old helmet was a Troxel and it never fit me. The tack shop in WI was extremely useless and you couldn't beg for help in fitting any piece of tack or clothing. I don't think the employees even knew what a horse was. They also only stocked Troxel and so I just grabbed one I liked, shoved it on my head and went with it. It was always slightly too big, sat like a mushroom and would rotate from side to side, but man was it comfortable! It was like I didn't even have it on which technically is about how well it would have worked in a major accident anyway. This shop was a whole different experience. They measured my head, asked what I was looking for and let me try on things as many times as possible while also trying to convince me that the vice like grip these had against my head was actually the way a helmet should fit. Apparently, when you move the front of the helmet up and down, your eyebrows should move with it or it isn't tight enough. We began with the Tipperary Sportage. This helmet comes in a static size: no dial a fit like my Troxel had. There are two sizes of pads you can add to the back (a thick and a thin. Heads up to the company - add a medium one too) to adjust the fit, but that is about all the adjusting you can do. Features I wasn't really fond of from the get go included: the static fit - what if I chopped all my hair off or wanted to shove it under the helmet or where a liner in the winter; the lack of a liner - can't wash the grunge out of it, and it really did feel pretty tight. Features that I liked from the start included: the low cut back of the helmet for better coverage for the back of my head, the massive vents, and it didn't rock from side to side on my head. The shop lady seemed to think it was a perfect fit and likes this helmet as a nice everyday helmet. The safety ratings are good as well. It also come in black which is sufficient for me. Next up was the Ovation Extreme. This was a two toned brown and black low profile helmet. She shoved it on my head and I had flashbacks to my Troxel. Then she turned the dial in the back and there was that new vice grip feeling I had missed. I actually really loved this helmet. It had the adjustable dial in the back so I could snug it up and have it fit no matter if I decided to go with a pony tail or long hair or chop it all off. It had a cool max removable liner claiming to keep you 5 degrees cooler which is a big deal here in the summer. The lower profile was nice for my small face and it was comfortable. I found myself missing the added security of the lower back from the Tipperary, but in general I liked this helmet a lot. My head is apparently oval in shape where the helmet sits. This is why the Troxel, a very round helmet, always rocked side to side regardless of how tight I made it front to back. The Ovation is also a round helmet and when it was properly snugged so that my eyebrows moved with the helmet, I could still get a whole finger between the sides of my head and the helmet. Not good. Darn. They also had a few IRH helmets and one even came in a "long oval" shape (yeah that doesn't make me feel awkwardly shaped at all) that fit well but I didn't really like the helmet much and it already felt hot and heavy and I was just standing inside a store. So it was back to the Tipperary. I tried it on again. And again. And again. Eventually I reconciled with my oval shaped head and then looked past the minor cons I had (although I still think any helmet without a liner is just ridicuouls and shouldn't even exist) and decided to purchase this one before my child knocked everything useless off the shelves. And then I saw it. The Samshield Shawdow Matte helmet in all its glory. The sales lady saw my glance and reached a hand out. She grabbed my size and offered it over to me. She remarked about all the customization options as I slid it over my long oval shaped head. My head breathed a sigh of relief. I saw stars. I heard angels singing. Ok...that is an exaggeration, but holy crap was that thing amazing. Light on my head, a perfect fit without feeling overly tight, lovely features and above all I could add red highlights!!! I was already picturing myself crossing the finish line at my first 100 with this baby on my head when I heard her say the worst words ever..."$430". Ah...crap :( I don't have $430. The lovely Samshield went back in its box and I grabbed my lowly Tipperary and walked to the register like a child pulled away from the candy store. Truth is, even if I did have $430 to spend on a horse item, a helmet is so very low on my list of priorities that it isn't even registering. The big ticket item that I do actually need right now is a second pad for Gem when we do the two days in April so she will have a dry, clean pad for the second day. That is $300. That is way more important than upselling myself with a helmet. So for now, the soul mate to my head will have to remain on the shelf until such a time that I win the lottery, remarry a sugar daddy or someone famous dies and randomly wills me all their cash. "Long oval" is a total gamechanger. 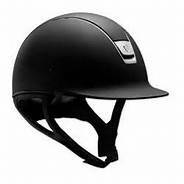 When I shopped for a helmet last year, I tried on the IRH long ovals and loved them. Which IRH did you try on? I can't remember what the model was. It was suede covered which I wasn't thrilled with given how I use my head to move tree branches out of the way. It also had a $130 price tag which was more than I wanted to spend. I've got an oval head, too, fortunately, Tipperary helmets fit me really well. It's so amazing to finally have a helmet that fits well! (I end up wearing mine when I'm driving home from the barn sometimes because it is so comfortable lol) And the liner thing has never ever occurred to me. 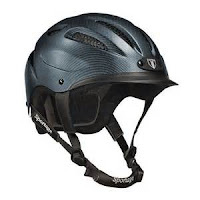 My climbing, skiing, kayaking/whitewater, and bike helmets are all liner-less. It's just the way of things for me, so it doesn't seem weird at all. Now that you mention it, my caving and kayaking helmets never had a liner either. I guess I never thought of that. Ok...I don't mind that feature so much anymore. I've been a Tipperary devotee since Florida. I learned about those helmets while working at a tack shop and they were by far our best sellers. Even in South Florida, where the coldest it got in winter was 75 degrees average, I never missed having a removable liner. I sweat a lot but my Tipperary never got stinky: those big vents are DA BOMB! You can FEEL the air moving through those vents on breezy days or when going at speed. I've had 5 of them so far and love them. Wouldn't use anything else for schooling/endurance. I have the same head shape as you btw: I can't wear Troxels, Ovations nor the newer IRHs. Saiph: that's good to hear about heat retention. This feels hotter than my trowel but my triceps didn't fit so that's probably why it was so airy. I've slowly gotten accustomed to it and think I will really like it. The price point is good too. I'm currently on my 4th Tipperary (replace when I get dropped on my head or when they hit their expiration date, whichever happens first) and really like them. Between the pads, and either braiding my hair or adding a Buff, I can pretty much dial in an ideal fit. At one time, Riding Warehouse sold these really thin, peel and stick liners that you could put across the front and then remove and toss when they got icky...not sure if they still have those or not, but that's one of the reasons I went to wearing a Buff under my helmet...keep some of the swat and dirt out of the liner. I did ask her how they could charge that much when there is a chance you could wear it one time and hit and have to replace it from a fall. They have a repayment plan where they give you money towards a new one based on how old your last helmet was. Apparently, Tipperary does too, but at the price point most people don't bother with the process. I'm an ovation girl. Couldn't get the Tipperary to fit at all. The woman at Dover took all the pads out and it was still tight on the sides, but super loose front and back. So I went with the Ovation Sport, I think. I wished the Ovation had fit my head. You must have a more round shape. I have the long oval head too. And I have some sort of IRH as my show helmet. I also have 2 Tipperary Sportage helmets. A black one for schooling and blue one for endurance/eventing (it has my helmet cam mount on it. I really like the vents and the fit. And the price is great as I can get new ones whenever they break or wear out. The liner thing is annoying, but I spray the inside of mine with isopropyl alcohol after each ride. Cuts down on the funk. Good idea. I will have to remember to do that this summer when it gets super hot. And yay for knowing others have the long oval head too! I'm a big fan of Tipperary helmets and am on my 3rd since 2004. I think the bigger vents and making sure it's not shoved in a bag while it's still sweaty keeps it from getting as funky and gross as other helmets, or at least I haven't really had any problems with funk. Even in the summer it drys well over night and I don't worry about it. I guess the only time it's been gross has been when I've ridden in it, taken it off, and then had to put it back on a few minutes later to ride another horse. If you ever want a Samshield helmet without the price look at the One K's. They're in the $200 range vs the $400 and fit similarly ;) but I still think you'll end up loving the Tipperary!!!! Or at least I hope you do! I rode in it the first time Tuesday night and really liked it. My head was hotter than in my old Troxel, but that is because the Troxel wasn't really touching my head much so there was plenty of air flow. I didn't remember I had it on at the end, so that was a good sign.